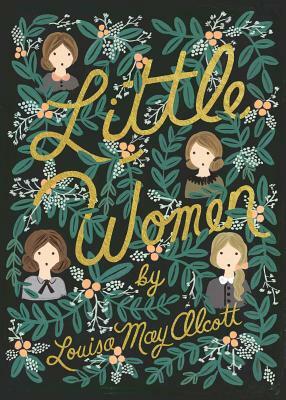 Louisa May Alcott's classic tale of four sisters in a deluxe hardcover edition, with beautiful cover illustrations by Anna Bond, the artist behind world-renowned stationery brand Rifle Paper Co.
Grown-up Meg, tomboyish Jo, timid Beth, and precocious Amy. The four March sisters couldn't be more different. But with their father away at war, and their mother working to support the family, they have to rely on one another. Whether they're putting on a play, forming a secret society, or celebrating Christmas, there's one thing they can't help wondering: Will Father return home safely? Based in Winter Park, Florida, Anna Bond of Rifle Paper Co., a worldwide stationery and gift brand, is an artist best known for her whimsical designs which often include hand-painted illustrations and lettering. She has created unique, illustrated covers for the Puffin in Bloom book collection, which includes such classics as L. M. Montgomery's Anne of Green Gables, Heidi by Johanna Spyri, and A Little Princess by Frances Hodgson Burnett. Louisa May Alcott (1832-1888) grew up in Concord, Massachusetts, and began her writing career at an early age, with short stories for newspapers and magazines. What began as a series of stories in the 1860s became the classic American children's novel we know today as Little Women.